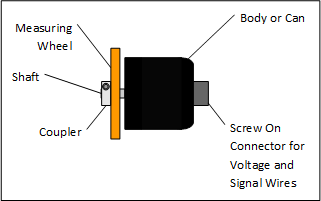 A rotary encoder is usually constructed from a body that looks like a can. It’s usually a metal cylinder that has an amphenol-style connector on the back, with a hardened steel shaft protruding from the front. Inside the body of the encoder, on the back of the shaft, you will find an opto-interrupter disc mounted. This wheels this disc will have precision cut holes, or slits, spaced evenly around its circumference equal to the counts per revolution of the encoder model. This disc rotates with the shaft of the encoder, which is turned by the friction of a measuring wheel rolling along the surface of the material flowing through the roll former. The outer circumference of the disc – the portion with the slits in it – rides through a beam of infra-red light. On one side of the disc, an LED is always shining light. On the other side of the disc are a pair of sensors. When the slit passes through the light, the infra-red beam is picked up by the sensors behind the disc, and a pair of pulses are sent out by the encoder to the length control system. For best results, you should mount your measuring wheel directly to the shaft of the encoder. Do not couple another shaft to the encoder shaft. To avoid damaging the encoder, Maintenance will often try to isolate it by coupling its shaft to another shaft that is mounted using heavy-duty bearing blocks. The problem is that encoder manufacturers typically use low-friction bearings inside the body of the encoder. This helps to ensure the friction between the measuring wheel and the material is greater than between the shaft and the bearings, minimizing the risk of slippage between the wheel and the material. In terms of troubleshooting problems down the road, having a mechanical coupling between the encoder and the shaft on which the measuring wheel is mounted can cause days of lost time. A broken coupler can be very difficult to see, especially if additional guarding is placed around the encoder mount, but the backlash allowed by the damaged coupling can cause a great deal of length variance. The control system must be programmed with the distance that is passing for each pulse. This is the linear distance measured by the wheel per pulse from the encoder, or resolution. Resolution is calculated by dividing the circumference of the measuring wheel by the number of post-quadrature pulses per revolution generated from the encoder. Circumference is the total linear distance traveled for one revolution of the wheel, and is based on wheel diameter. It’s calculated by multiplying the wheel diameter by pi, a mathematical constant approximately equal to 3.14. Once the circumference of the wheel is known, resolution can be calculated by dividing the circumference by the number of pulses per revolution from the encoder. This is why consistent encoder measuring wheel tracking is so important. Each missed or incorrectly measured pulse throws off the computer’s ability to correctly measure the product.